There is nothing like seeing cybersecurity in action before your eyes to understand how it can be employed in your business. That’s the spirit that has driven Wibu-Systems to organize an intense demonstration program for the upcoming edition of the Hannover Messe. In its own exhibition space in hall 8, booth D05, and alongside dozens of other IIoT trailblazers, the company will be showing how security ecosystems and applied security frameworks can prevent the cyber-attacks that connected systems will inevitably have to face. It all starts at Wibu-Systems’ booth, where an embroidery machine from our long-standing customer ZSK Stickmaschinen is protected with CodeMeter, the all-in-one technology for protection against counterfeiting, reverse engineering, and tampering. As the recent study on product piracy conducted by the German Engineering Federation VDMA illustrates, attacks to the know-how of products, machines and entire manufacturing facilities are becoming rampant as Industrie 4.0 is taking off. CodeMeter encrypts source code, machine code, and sensitive configuration data and stores the digital keys in a preferably hardware-based secure element, namely a dongle in the form factor of a USB stick, a memory card, or an ASIC. The protection capabilities come alongside license lifecycle management to also boost revenues by enabling versatile sales strategies that meet all customers’ demands with modular licensing and pricing. The embroidery machine will then provide a syslog (security incident information) to the SIEM (security information and event management) system of a broader demonstration set up by the Industrial Internet Consortium (IIC) and the Plattform Industrie 4.0. In their collaborative effort to outline common guidelines between RAMI and the Industrial Internet Security Framework, the two organizations have gathered 24 companies that have been working closely for the last five months to provide an interoperable security concept. The core of the demonstration can be found at booths C24 and D24 in hall 8, but the demonstration expands into other booths and halls throughout the fair, to other parts of Germany, and even other parts of the world. The goal is to demonstrate that endpoint security is achievable with current technologies even in heterogeneous architectures that mimic a real-world distributed multi-vendor constellation. 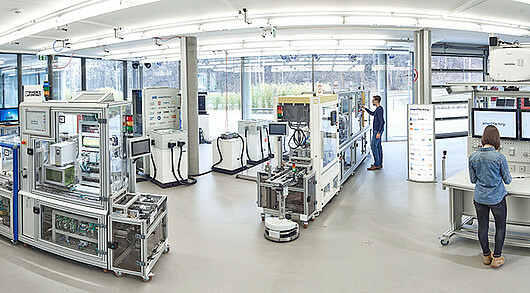 Wibu-Systems is also cooperating with SmartFactoryKL, a technology initiative promoted by the DFKI, the German Research Center for Artificial Intelligence. The cross-site demonstration on display in hall 8, booth D20, is joined by 18 pioneering companies, each contributing its specific expertise for the dawn of a new industrial age. CodeMeter by Wibu-Systems provides the technology required to achieve comprehensive and strong IT security standards in Industrie 4.0 production facilities. It protects software components against unauthorized access and manipulation. Cryptographic keys, e.g. used for authentication in OPC UA, are stored and used securely on CmDongles. CodeMeter’s license management capabilities allow fine-grained controls over software features or the configuration or confidential production data. IUNO, the German Reference Project for Cybersecurity in Industrie 4.0, has also made remarkable progress. In the last year, all four application areas of customized production, technology data marketplaces, remote maintenance, and visual security control centers have made great strides towards ultimately offering SMEs a security blueprint. In hall 2, booth B22, IUNO’s members will be presenting the current results of their work to establish cross-domain trust for the manufacturers of networked products. To illustrate the concept of the license-based economy, Wibu-Systems will use CodeMeter License Central, their web-based entitlement platform, to associate licenses with beverages: Drinks are served and billed based on the customer’s order. In a separate project, Wibu-Systems will explore endpoint security by design: CodeMeter Runtime is used for the remote maintenance of clients, and CodeMeter Embedded for the remote maintenance of machines.